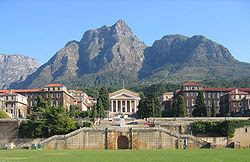 The University of Cape Town (UCT), is a public university located on the Rhodes Estate on the slopes of Devil's Peak, in Cape Town in the Western Cape province of South Africa. UCT was founded in 1829 as the South African College, and is the oldest university in South Africa. UCT's success can be can be measured by the scope of study it offers and the calibre of its graduates. The university has six faculties - Commerce, Engineering & the Built Environment, Law, Health Sciences, Humanities and Science - which are supported by UCT's Centre for Higher Education Development, which addresses students' teaching and learning needs. Among its more than 100 000 alumni are the late Professor Christiaan Barnard, the world-renowned heart surgeon, and three Nobel laureates, Sir Aaron Klug, the late Professor Alan MacLeod Cormack and JM Coetzee. UCT also has more than 60 specialist research units that provide supervision for postgraduate work and is home to more than a quarter of South Africa's A-rated researchers - academics who are considered world leaders in their fields. UCT continues to work towards its goal to be Africa's leading research university. The roots of UCT lie in the establishment of the South African College, a boys' school, in 1829. In 1874 the tertiary education part split off into the University and the younger students into the South African College Schools. UCT moved to the Groote Schuur Estate campus in 1928. During the apartheid era, roughly 1960-1990, UCT consistently opposed apartheid, and was a bastion of liberalism and racial integration. 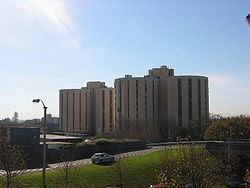 1987 particularly saw frequent clashes between protesting students and police, with reporting of police presence on the campus being censored by the government. On 24 April 1987 the police entered the campus and this marked the first time since 1972 that South Africa's police services had suppressed a demonstration at a white university.The official student newspaper, Varsity, frequently had its journalists and editors come under scrutiny from the ruling apartheid National Party government. 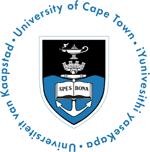 The UCT crest was designed in 1859 by Charles Davidson Bell, Surveyor-General of the Cape Colony at the time. Bell was an accomplished artist who also designed medals and the triangular Cape stamp. UCT is a member of the Association of African Universities, the Association of Commonwealth Universities, the Cape Higher Education Consortium, Higher Education South Africa, and the International Association of Universities. Max Theiler, virologist awarded the Nobel Prize in Physiology or Medicine in 1951 for developing a vaccine against yellow fever.